The candidates seeking to succeed Democratic Gov. Deval Patrick made their final pitches to voters in the closing hours of the campaign on Monday, while also taking time to attend the funeral for longtime Boston Mayor Thomas Menino. Democratic Attorney General Martha Coakley and Republican Charlie Baker, the former head of Harvard Pilgrim Health Care, looked to rally their base and reinforce their field organizations before polls opened at 7 a.m. Tuesday. Secretary of State William Galvin, the state's top elections official, predicted nearly 2.3 million Massachusetts voters will cast ballots in the election, close to the number who voted in 2006, the last time there was an open race for governor. Voters will also be deciding races for the U.S. Senate, attorney general and the state's other constitutional offices, along with the fates of four ballot questions - including one that seeks to repeal the states' 2011 casino gambling law. Coakley, starting her final full day of campaigning at a Cambridge construction site, told workers she felt enthusiastic about her chances, adding she expected the race to hinge on the "ground game" - meaning the get-out-the-vote efforts by both candidates. "We have had $9 million thrown against us because the Republican Governor's Association and the Koch brothers want to buy this election," Coakley said, a reference to outside spending on behalf of Baker. She told supporters to ignore recent public opinion polls that showed Baker with a slight edge. The Republican began his day by campaigning in Braintree with Democratic Mayor Joe Sullivan. Baker has touted the endorsements of a number of Democrats, including the mayors of Quincy and Gloucester, as part of an effort to overcome the institutional advantage the Democratic party typically enjoys in Massachusetts. Baker stopped by one of his campaign offices in Stoneham on Monday afternoon, shaking hands and receiving a loud ovation from supporters who were busily making phone calls to potential voters. 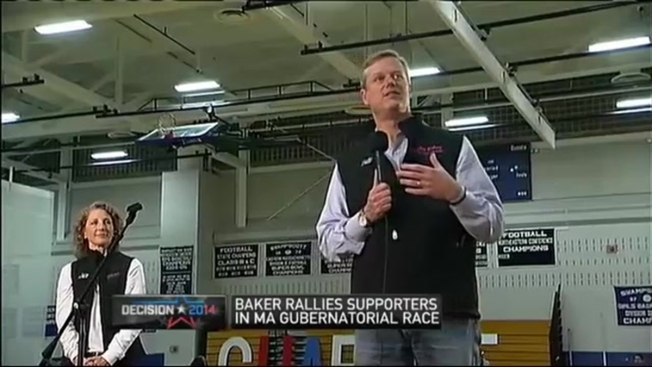 Baker said he felt upbeat about his field organization. "It's going to do a terrific job," Baker said, even as he acknowledged Democrats have created a solid get-out-the-vote operation in Massachusetts. "Let's face it. They've done a great job over the years on that," he said. "I can't control whatever they do. What I can control is what we do and we started knocking on doors and making phone calls back in May." Baker said his campaign had knocked on almost 500,000 doors, made more than 3 million phone calls and done "a pretty good job of identifying our vote." Baker also touched on some familiar campaign themes. "We should continue to point out the differences between the attorney general and me," he said. "I'm not going to raise taxes. She clearly will." The final day of campaigning was being overshadowed in the city by the final goodbye to Menino. His funeral procession stopped in several locations around Boston before arriving in his home neighborhood of Hyde Park, where a funeral Mass was said at Most Precious Blood Parish. Three independents, Evan Falchuk, Scott Lively and Jeff McCormick, are also on Tuesday's ballot for governor. Patrick did not seek re-election after two terms.